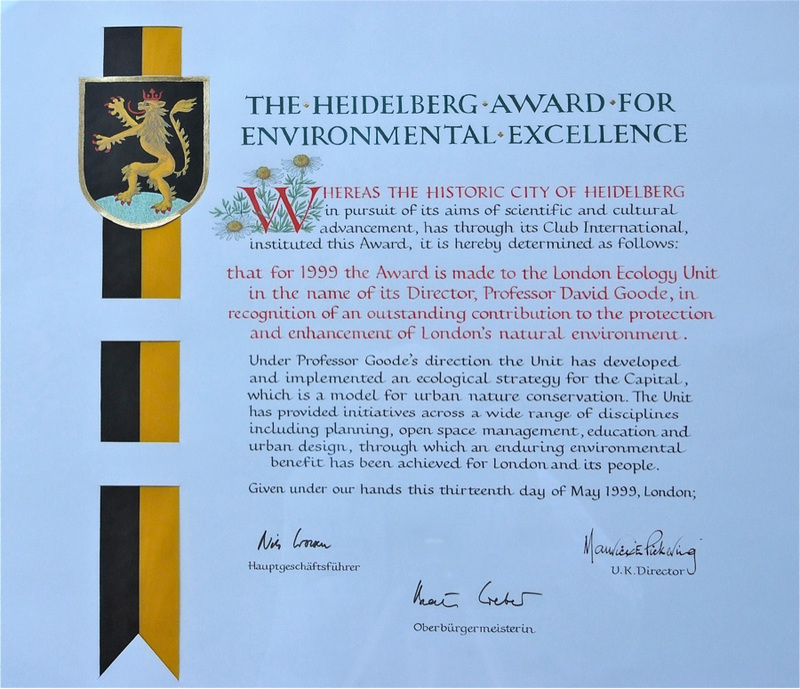 The prestigious Heidelberg Award for Environmental Excellence has been awarded since 1997 by the City of Heidelberg for outstanding contributions within the environmental sphere. Instigated by former Mayor of Heidelberg, Beate Weber through the city’s International Club, the award has been made by an international panel of judges. Recipients have included Sir John Bebbington (later Chief Scientific Advisor to the UK Government), Professor Tjeerd Deelstra, Director of the International Institute for the Urban Environment in Deft, and Mike Houck, Director of the Urban Greenspaces Institute in Portland Oregon. Professor Goode received the Award in 1999. David Goode has made an outstanding contribution to nature conservation in the UK having been a key player in the early days of the Nature Conservancy Council and a recognised expert in our upland bogs and mires. He is probably most well-known, however, for his focal role in global urban ecology. David is rightly recognised as one of the pioneers of urban ecology here in the UK. As the first Senior Ecologist at the Greater London Council, then Director of the London Ecology Unit and latterly Head of Environment at the Greater London Authority he was the person behind recognition being given to non-statutory sites of nature conservation interest in London, persuading local authorities to support his ideas even though they did not have to at a time when landscape and the environment was not high on the political agenda. His ideas were quickly taken up elsewhere. He transformed the way ecologists, land managers, landscape designers and planners thought about urban ecology and the relationship between people and wildlife. His combination of technical expertise, political nous and quiet perseverance was instrumental in gaining support for his ideas which has hugely benefited the people of London and influenced urban land management across the UK and beyond. He pioneered the concept of ecology parks, not only protecting what was there but creating new habitats in urban areas for public enjoyment and environmental education. He understands that in order to improve the quality of people’s lives nature has to be local to where people live as well as ‘out there’ in the countryside. He has embraced the wider topics of eco-urbanism and sustainability to become a spokesperson for a saner, more sustainable way of living. As a practising ecologist David has always promoted greater understanding of ecological issues among decision-makers, especially politicians. Most notable was his timely review of habitat loss in Britain, published in the New Scientist in 1981, which became immensely influential during parliamentary debates on the Wildlife and Countryside Bill, leading to greater protection of SSSIs. At various times he has had direct input to the Government’s Planning Policy Guidance for Nature Conservation, and contributed substantially to the UK Action Plan for Biodiversity, particularly on the role of Local Authorities. Despite retirement David continues to advise, inform and share his encyclopaedic knowledge of the subject with others. David’s visionary work has inspired many within our profession and, indirectly, he has touched the lives of millions of people living in our towns and cities. He is well-deserving of the CIEEM Medal.